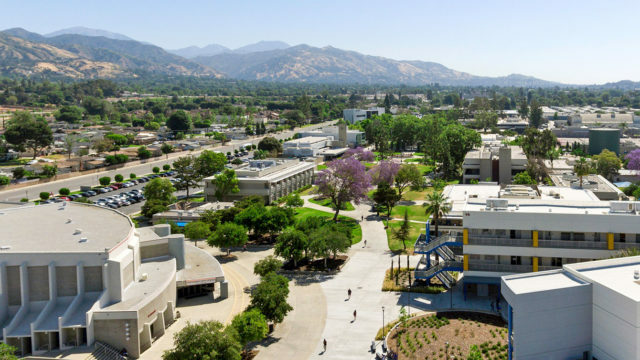 A 30-year-old Chino man who allegedly threatened Tuesday to “shoot up” Citrus College in Glendora, prompting lockdowns at that school and nearby Azusa Pacific University, was taken into custody and police were investigating if he was seeking to commit suicide by cop. The investigation began after Glendora police received a call from a male threatening that he was on his way to “shoot up” Citrus College, located at 1000 W. Foothill Blvd., according to the Glendora Police Department. The threat was treated as credible and the college campus and surrounding streets were locked down at 11:28 a.m., according to Glendora police Sgt. Shawna Celello. Assistance was requested from surrounding law enforcement agencies and a regional SWAT team was activated, Celello said. Officials at the college tweeted that the incident was “not a drill” and urged people to stay clear of the campus. Those already on campus were told to turn off lights, lock doors and remain quiet as a room-to-room search was conducted. Over 100 officers assisted in the search, officials said. In response to the situation, nearby Azusa Pacific University also was placed on lockdown and university officials urged people on that campus to shelter in place. “The suspect, identified as 30-year-old Terrell Lee Bennett from Chino, surrendered peacefully and was taken into custody without further incident at 3:42 p.m.,” according to Celello, who said Bennett is an online student at Citrus College and was scheduled to have an in-person class Tuesday. Based on Bennett’s statements, “suicide-by-cop appears to be a possible motive” behind the threat, Celello said. Citrus College announced that operations would resume as normal on Wednesday with all classes in session. Anyone with additional information about Bennett was urged to contact Glendora police Sgt. Michael Henderson at (626) 914-8281 or mhenderson@glendorapd.org.